If you can't reach Narya or Mariejel, assume a "yes" when you (a techinc member) want to bring the wheel to an event. Please put it back on the wall when the event is over. If the LEDs come loose you can simply put it back with double-sided tape and/or ductape. The data pin is 12 and the clock pin 11. Feel free to put your Arduino code on it, add sensors or whatever. Currently the ColorPalette code runs on the Arduino. 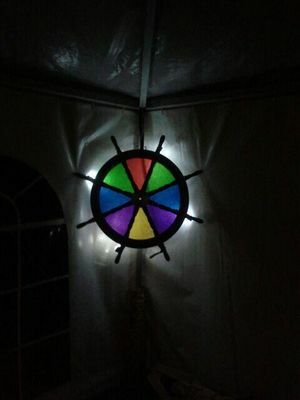 This project has several parts: backlit the wheel, mount the wheel to the wall or on some stand, and make the wheel control something. It would be nice to be able to unmount the wheel and take it somewhere else, e.g. to display it at events. This page was last edited on 19 April 2017, at 21:33.